Blue chip stocks are among the most stable and recognizable companies on the stock market. The definition of a blue chip stock varies, but it is generally thought of as a big, stable, secure company whose stocks serve as a bellwether for the market. The most common way to invest in blue chip stocks is to add them to an investment portfolio, usually through the help of a broker. 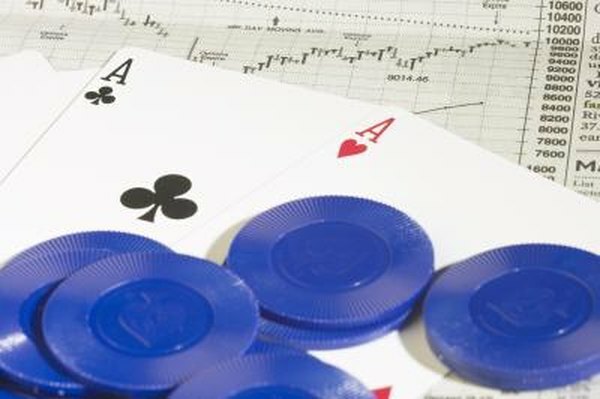 Since there are dozens of blue chip stocks from which to choose, investors should evaluate the company's performance against the goals of their investment strategy. Blue chip stocks are "large capitalization" companies, often called large-cap stocks. The market capitalization of a company is figured by multiplying a stock's share price by the number of outstanding shares. Companies with a market capitalization of more than $10 billion are considered to be large-cap stocks. It takes more than large market capitalization to be a blue chip stock, as these companies aren't just big, but also feature tried-and-true business models that are likely to remain strong well into the future. The most complete listing of blue-chip stocks is the Dow Jones Industrial Average, which is famous for tracking the health of the U.S. stock market. Blue chip stocks usually produce several of the top products in the markets they serve and these stocks often pay dividends. While there are 30 DJIA listed stocks, there are other large companies not listed that could be considered blue chips. Dow Jones produces other indexes that include some blue chip companies, including the Dow Jones Transportation Average and the Dow Jones Utility Average. Many blue chip stocks are listed on the Standard and Poor's 500, which is an index of the largest U.S. companies. Since there are many to choose from, selecting blue chip stocks requires that investors screen them for the criteria that fits their portfolio strategy. Investors should consider several factors when evaluating a blue chip stock, including the dividend payment, the bond rating on its debt, its earning growth and its interest coverage, which shows whether a company can meet its debt. Some blue chips have steady and stable performance, while others have more potential for growth and volatility. If you can't decide which blue-chip company you want to invest in, you can choose from several exchange-traded funds or mutual funds that focus on blue chip stocks. When evaluating mutual funds, consider the fund's annual yield and its annual average expenses. ETFs are traded like stocks, so consider the share price, but also take into account the expense ratio, which is the cost to manage the ETF. For both funds, you should also consider the stocks included in the fund's account to find what fits with your investment strategy.